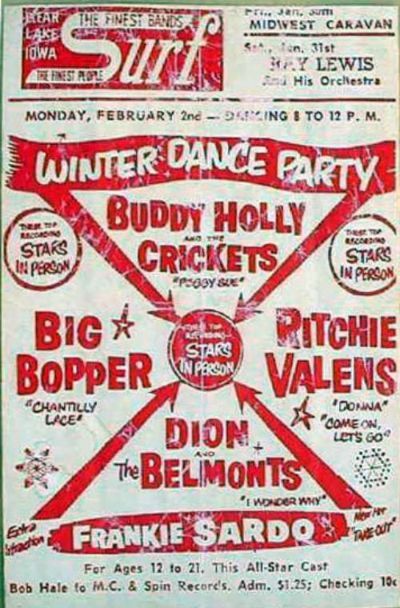 Fifty years ago today, a private plane carrying Buddy Holly, Ritchie Valens and J.P. “The Big Bopper” Richardson crashed in an Iowa cornfield, killing all three, and instantly setting the progress of rock music back by at least five years. Listen to “Well…All Right” and you’ll see what I mean. To say that Holly was “ahead of his time” is cliche, but it is true, and that song proves it. The emotions expressed in that song (not to mention the music itself) are more complex than anything anyone would hear until 1965, with the release of Rubber Soul. Blind Faith did a great cover of this song on their album. But listen to the original first. This event was immortalized as “The Day The Music Died” in Don McLean’s “American Pie,” an eight-minute epic that traces the history of rock ‘n roll from Feb. 3, 1959 through about 1970 and connects Holly, Valens and the Big Bopper to Bob Dylan, The Beatles, The Byrds, The Rolling Stones, and Janis Joplin. Listen to Don McLean too, but listen to Buddy Holly first.